Occurrence of acne in infants is a common condition; it is a naturally occurring skin disease which clears up in a matter of weeks. Acne like bumps on the surface of the face are caused by trapped oil on the skin follicle. Infantile acne generally appears on the baby’s cheek but may often cover the forehead and the chin. Slight blemishes on the skin are due to exposure to hormonal alterations in the womb preceding childbirth. This needs no treatment but may recur after six months. Persistence of this condition may suggest early sexual hormonal production. In this case, the infant must be examined by a physician to determine if there exists a genetic predisposition to acne development. Children between the ages of two and six are usually in the acne free zone, meaning acne development will cease between these ages. In addition to this, if cases of acne are seen during this stage of life, it is important to consult a physician. This condition may also suggest a problematic hormonal balance in the child. The American Academy of Dermatology states that there are several reasons behind acne production in puberty. One is the result of excessively productive Sebaceous glands. These glands produce Sebum and are attached to the hair follicles. Sebum is an oily substance which produces blemishes on the skin if trapped on the hair follicles. Acne can also be a product of bacterial reproduction at an abnormal pace. 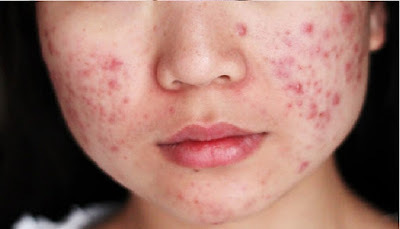 Doctors often provide treatment using topical antibiotics; these are efficient in destroying Propionibacterium acnes, which is the primary cause of acne. Additionally, unduly quick shedding of dead skin cells and the release of toxic substance on to the skin may also be the cause of this skin disorder. During puberty, excess hormonal production usually occurs in teenage boys due to the significant hormonal changes that occur in a boy’s body. This unnecessary elevation in Sebum production may often result in skin lesions. Consequently, it is quite common for teenage boys to experience this form of acne. Although it is often difficult to treat acne during pubescence, it is the diversity of causes which must be properly analysed so as to provide the best treatment. In cases where over-the-counter medications don’t work, a physician must be consulted to provide alternative options in caring for this skin disease. Determining the root cause of acne may take some time, but eventually, it will be discovered and hopefully this will lead to a comprehensive remedy for this skin disorder. Chiefly due to hormonal changes, 5% of people who develop acne are infected in their adulthood while the remaining percentage experience this skin disease during puberty. In addition, this skin disorder is sometimes a hereditary disease and is often a manifestation of an abnormal hormonal imbalance. Adult acne may worsen during pregnancy because of hormonal changes in the women’s body. In several cases, oral contraceptives are often applied as treatment to improve conditions dealing with adult acne. Alcohol, emotional and psychological stress and hot foods can intensify the condition. Dermatologists usually prescribe topical medications that contain Salicylic acid or sulphur to lessen the outbreak of acne and the burning sensations that accompany it. It is advisable that people infected with this skin disorder limit exposure of their skin to sunlight and must as much as possible avoid using oil-based cosmetics.